Breyer tack and accessories include many good quality off-the-shelf English saddles that fit a wide range of Breyer horses. After frequently handling, the saddle pads that come with your Breyer horses can get stained and discolored. You can make a very simple saddle pad out of white or ivory colored felt using these directions. Felt - white, off-white, or ivory colored felt is best. If you plan to photograph your Breyer horses for photo shows or show them in live model horse shows, choose white felt, since English saddle pads are typically white. Sewing Chalk Pencil - Sewing chalk pencils come with a blue tip and a white tip, and a special cap with a brush attachment. The marks brush right off of materials without staining it. Tape measure with millimeter marks. Huntseat style saddle pads are shaped to match the saddle, with about 1 to 3 inches of white pad showing beyond the saddle. The purpose of an English-style saddle pad is to provide protection for the horse's back and to cushion the saddle, preventing sores. Natural or artificial fleece is typically used for a real English-style saddle pad. For your model horses, felt will substitute for fleece, since real fleece has a very thick nap that makes the saddle pad out of proportion with the model horse. 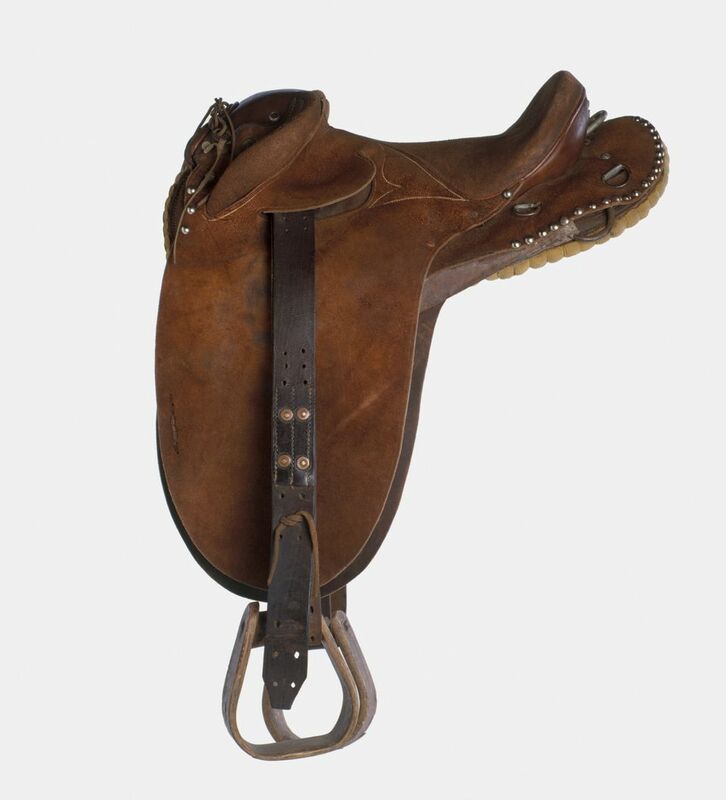 If you can, remove the girth from your saddle by undoing the buckles and straps. Place the paper on a flat, clean surface. Lay the saddle flat on the paper. Using your pencil, trace the outline. Cut the paper template out. Now use your paper template to trace an outline slightly larger on the felt. You can scan the template into your computer and increase the size of it slightly using an imaging software to make a template the right size. Print the new template out. Place it on the back of your favorite Breyer horse, and place the saddle on top. Check the measurements. Does it look realistic? Use a reference photo of a real hunter-style show horse and note how much of the white pad is showing. Does yours look similar? If it looks okay, remove the saddle and pattern from the horse model. Trace the paper pattern on the felt. Cut out the new saddle pad using sharp scissors, carefully following the line you've traced. If you can't scan it into the computer, you can also use your tape measure to carefully measure a slightly larger outline of the paper pattern onto the felt. Place the original paper tracing of the saddle onto the felt. Using one colored end of the sewing pencil, gently and lightly trace the pattern. Remove the paper. Take the other color end of your sewing pencil and tape measure and measure off 1-2 millimeters from the rim of the tracing. Use dots to mark each spot that you measure. Using two colors can help you distinguish each outline on the pattern. Carefully connect the dots to make an outline larger than the original pattern and saddle. Cut the outline out of the felt. Use the brush cap on the sewing pencil to remove all traces of the chalk. Always check how the final saddle pad fits by placing it on your model, carefully adding the saddle, and tightening the girth. Eventually, you should have a nice new saddle pad for your favorite Breyer horse and tack.